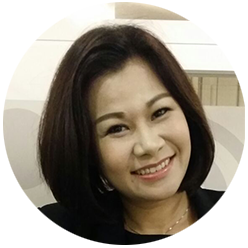 Chriscillia started her career as a cabin crew with Singapore Airlines (SIA) back in 1994 and currently holding the rank as a Chief Stewardess. While she was enjoying the life style traveling over the world, she is also a free-lance grooming, image and etiquette trainer. She graduated with a Diploma in Professional Makeup and Hair Styling with “School of Makeup” in Singapore and completed her Style Coach training in 2015. In 2016, Chriscillia completed the Image Flair Academy of Modern Etiquette Certification on Elite Certified Etiquette Professional ®, an intensive training program led by Eunice Tan, founder and its international Partner Civility Experts Worldwide, Chriscillia joined an elite group of highly-trained, etiquette professional. In 2013, Chriscillia founded the Grooming Academy, a makeup school of SIA that consist of 300 members and 10 SIA cabin crew trainers. As the chairman of the academy, she is well known and respected as a top artist and trainer with longstanding experience across the entire spectrum of beauty. Her positive attitude, willingness to face new challenges head on and conviction to see through all grooming and makeup projects from start to finish, plus 20 years of airline experiences, has helped Chriscillia acquire the skills and abilities to become one of the top professionals in her field. Chriscillia Lee is also a leader in customer service, multicultural sensitivity, building rapport in a diverse environment and helping others understand the importance of self-confidence and continued learning. Capable of working independently, with others, or leading the way, Chriscillia has all the personal and professional skills that are required for any success or endeavor. Currently, Chriscillia holds a degree in Tourism and Hospitality in University of Wales and diploma in Leadership Professional and Management and ACTA certification with WSQ. She is involved in grooming campaigns in SIA, and grooming and etiquette workshops for schools and corporate companies.